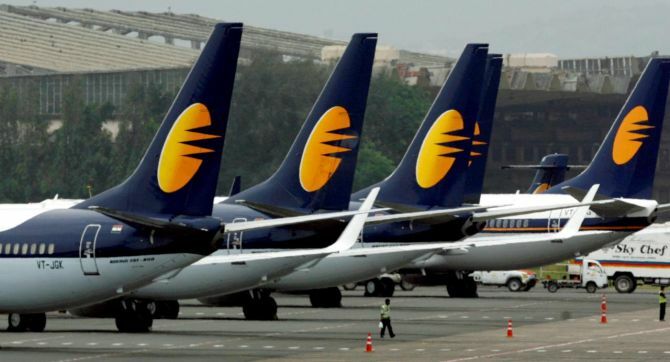 Cash-starved Jet Airways flew into deeper troubles on Wednesday after IndianOil stopped fuel supplies, a cargo agent seized a Boeing plane in Amsterdam and its lenders extended the deadline for stake sale bids by two more days. The regulator DGCA has de-registered seven of Jet's Boeing 737-800 aircraft and allowed their lessors to take the planes out of the country so that they can be leased to other airlines. Cash drought has forced the airline to default on several payment obligations such as to the banks, aircraft lessors and other vendors besides non-payment of March salaries to its employees. Its pilots, who along with engineers and senior management have not been paid since January, had on Tuesday sent a legal notice to the management which is currently being headed by the lenders led by State Bank. This was the third time since last Thursday that the oil company stopped supplying fuel to the crumbling carrier. But late in the evening IOC said the supplies were resumed. Potential bidders can send their queries till April 11, it said hours before the Wednesday deadline. The SBI Caps in a statement said it was extending the deadline in order to allow better participation in the process. SBI Capital Markets had invited Expression of Interest (EoI) from prospective investors on behalf of the domestic lenders of Jet Airways Limited, it said. "As part of the process, we are in receipt of some EOIs and some more persons have expressed desire to participate if additional time is provided," it said. Accordingly, to allow better participation in the process the domestic lenders have agreed for extension of the timeline for submission of Expression of Interest which have been updated and made available on the websites, it added. "Bidders are required to provide the solvency certificate ... on their letterhead and certified by managing director/full time director/CEO of the bidder or a person holding an equivalent position in the bidder," it said. As part of the debt resolution plan for the carrier, the lenders are looking to restructure "existing facilities and infusion of funds by way of loans or acquisition/subscription of up to 75 percent of equity share capital of the company".